Not only does myrrh utilize antioxidant properties to seek out free radicals and reverse oxidative damage, but it may be able to eliminate cancer cells, as well. Researchers in China recently published their findings on myrrh’s cancer fighting abilities, after lab tests demonstrated the inhibition of cancer cell growth. (6) As with most cancer research, the steps forward toward proven treatments are detailed and difficult, but the foundation is clearly there, and the potential is absolutely intriguing! So how exactly does one utilize such a powerful, ancient, even holy substance? Honestly, however you’d like! The healing properties of myrrh oil have an increasingly well-studied background, and has been demonstrated as one of the most effective remedies in more than one category. While it isn’t so much an immunomodulator for illness prevention, its healing capabilities are quite possibly unmatched. Microbes are all around us, in many shapes and forms both beneficial and deleterious. When we’re thinking in terms of pharmaceuticals and traditional medicines, there are treatments for bacterial infections, another treatment for fungal infections, and still others for viruses. Prevention is compartmentalized, as well. The mouth is a dirty place. We’re exposed to so much through our mouths, making it a hotbed of microbes and potential illness. When we do get sick, our mouths often notice first – sore throats, phlegm, and other discomforts settle in as one of the first signs of many illnesses. What’s more, diseases of the mouth and gums are all too common. Utilize its antiseptic, antimicrobial, and wound healing effects by putting a drop on your toothpaste when you brush your teeth each night. No one wants to think about parasite infestations, but what we really don’t want is to be caught with a parasite and unable to treat it. Egyptian scientists tackled this issue, as well, working with patience who had signs of parasites in their stool. Antiparasitic treatments are often harsh and come with intestinal discomfort. 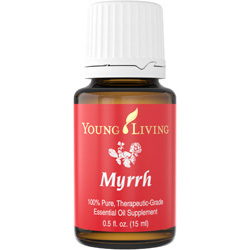 After testing a treatment utilizing myrrh essential oil, “no signs of toxicity or adverse reactions” were a problem and the treatment was successful. (11) This was against a specific parasite, of course, but the potential for improved treatment and even protection against infection exists!